The hatch is on! Our annual Grey Drake hatch has made it’s appearance and this year will be one for the books. We are seeing epic numbers of these big, extended-body mayflies on both the Green and the New Fork. Water levels are high and clear with quality fishing from the drift boat or the bank. The smaller tributaries are becoming more approachable and the small stream fishing is just kicking off. The Green River is fishing good from the headwaters all the way to the Sommer’s access. Golden Stones, PMDs, and lots of Grey Drakes. All upper stretches of the New Fork down to Hwy. #351 are running clear and fishing well. Access issues exist (read below); however, our access to a private boat launch below the airport bypasses these obstacles, and opens up some great water that is seeing very little pressure due to the closures. Golden Stones, PMDs, and lots of Grey Drakes. The airport boat ramp on the New Fork River is currently closed due to the access road having washed out. There is no definitive statement from Game and Fish as to when the boat ramp will re-open. Other areas of concern include the bridges over the New Fork below town and below Boulder. Both of these bridges are extremely tight due to the high water conditions. Floating below the town and Boulder boat launches with high-sided watercraft is not recommended. Stay tuned for more information. We will be posting frequent updates as the season progresses. You’ll read it here first! 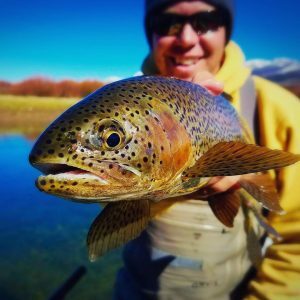 Get in on these prime Green River and New Fork River conditions. Book your fishing trip today! Green River: Flows at Warren Bridge are 2,250 cfs. New Fork River: Flows at Hwy 351 are 3,300 cfs.